The preferred field glasses for German Bundeswehr troops. Built tough to military specs for rugged durability and performance in demanding conditions. Ideal in low-light...for hunting, birding, exploring and more. 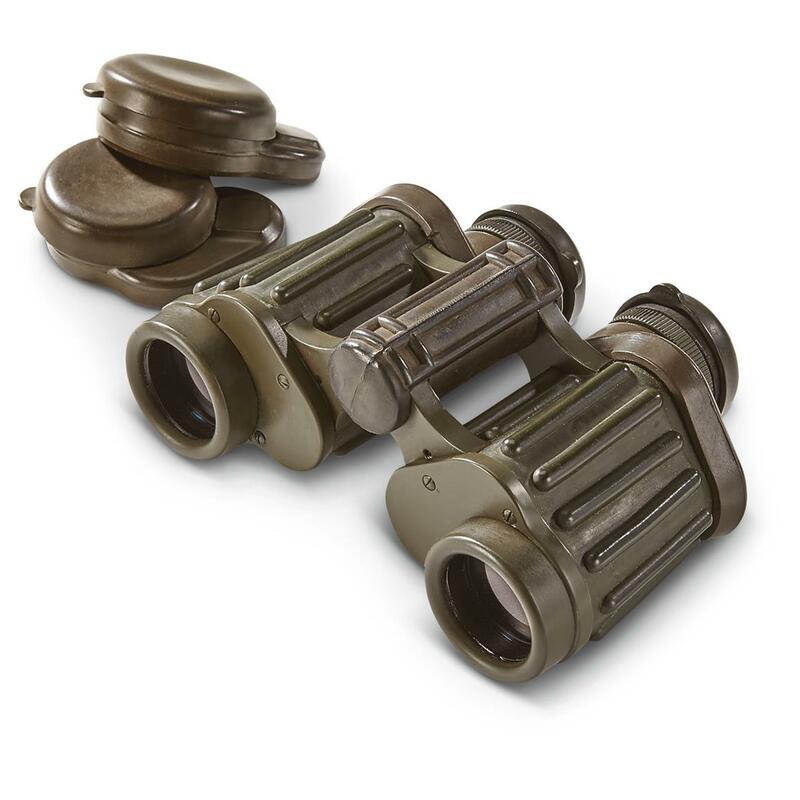 German Army Surplus Hensoldt Zeiss 8x30 Binoculars, Used is rated 4.2 out of 5 by 42. Rated 1 out of 5 by JOEY from VERY DISAPPOINTING! THE ITEM WAS OBVIOUSLY OLD AND ABUSED, APPEARED TO HAVE BEEN REPAIRED AS TO THE DIFFERENT SHADES OF COLOR, THE EYE PIECE CAPS WERE DRY ROTTED AND ALWAYS IN THE WAY WHEN USING. THE HINGES WERE DRY ROTTED AND CRACKED. WITH REGRET I REQUESTED AUTHORIZATION TO RETURN AND RECEIVED PRINTED RETURN LABEL WHICH COST OVER SEVEN DOLLARS. THE OPTICAL QUALITY WAS ON A LEVEL WITH INEXPENSIVE SIMMONS BINOCULARS. Rated 5 out of 5 by 0002S from Appeared to be unissued. The binoculars showed very light storage wear. The rubber cups were a little dry, but I removed them for easier use. The lens were clear and free of dust and scratches. The individual eye focus rings where smooth and held focus. The ranging marks in the right eyepiece are clear. These binoculars have an incredible FOV. The glass coatings, given the technology for its age, are remarkably clear and crisp at the center. There is very little drop off at the edges. Color is neutral with maybe a very slight blue tint. Very little CA. If there is a complaint it’s that they are as bright, in extreme low light, as newer night end glass. Given the technology of their day this would be expected. Well worth the purchase at this price for a great pair of military grade binocular. Rated 5 out of 5 by JackL from Great Hensoldt Field Glasses These are great field glasses with quality glass. Mine were in the German wrap and appear as new. Wish I had the case but really not necessary as the lens covers protect them from the elements. Rated 4 out of 5 by Not Applical from The binoculars are good quality, but we are disappointed they do not have ZIESS on the binoculars. Rated 5 out of 5 by Drewboy from Very please with binoculars, Hensoldt glass is one of the best glass out there. Rated 5 out of 5 by Had210 from like new Great binoculars. I bought an initial pair and I was extremely happy. It arrived vacuum sealed from Germany. Went back to the well and ordered a second pair...arrived in the same great condition. I believe these are the top grade in condition. Both pair have the range finder/scale in the eyepiece. Rated 5 out of 5 by dayhome from Good product and good price. The first pair they sent me was in pretty rough shape. But I returned them, and they sent me a different pair. This pair is really nice, just what I was looking for. Rated 3 out of 5 by Gale from Returned The pair I received were too used. The whole order was returned for similar faults.